If you want to master the whole range of delegation options, then you need to know the differences between the different kinds of delegating on the Delegation Spectrum. 1. Ambassadorial Delegation. 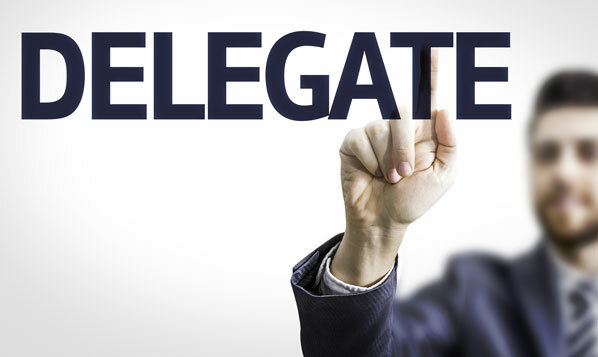 The word “delegation” is derived from “legate”, another word for ambassador. At this level, you are simply asking someone else to stand in for you. A delegate was originally the lieutenant of a Roman general who spoke on his behalf. Choosing someone to represent you has obvious advantages for you — it frees your time for more important things – and obvious advantages for your delegate who gets a taste of work outside their normal line. 2. Allocating Delegation. Moving up the scale, we come to allocating delegation. This is when you hand over a full task to someone with responsibility for deciding how, when, and where it will be done. As a rule of thumb, senior managers should aim to allocate 90% of the tasks that fall on their desk; middle managers 60%; and junior managers 30%. 3. Ownership Delegation. The middle option in the Delegating Spectrum is Ownership Delegation. In 1750 Europe, 95% of the population were self-employed or owner-managers. This figure went down to 50% in 1900 and just 10% in 1980. By 1990 it had risen again to 20% and, on present trends, will reach 50% again in the mid 21st century. When looked at in this way, owning our talents and owning our jobs is far more natural to human beings than giving them to someone else. That’s why there’s nothing wrong in giving responsibility, accountability, and ownership back to people in their jobs. When you do that, you also hand back pride, trust, and a sense of esteem. 4. Developmental Delegation. Developmental delegation can be by far the most important of the various acts of delegation. It is delegating with a long-term purpose. It grows the one resource which is limitless: your own staff. It can be undertaken as part of a formal scheme or carried out almost unseen as part of the daily acts of team leadership. When it works, developmental delegation can be the most valued, beneficial, and rewarding of all the acts of management. Delegation is at the heart of management. To some extent, it is management. When you choose the right person, the right task, and the right delegation style, you’re almost certain of success. Eric Garner is the founder of ManageTrainLearn a useful training resource for managers. Article © Eric Garner, ManageTrainLearn.com.